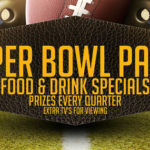 Huggo's On The Rocks | Kailua Kona Casual DiningSuper Bowl Bash a Success! Super Bowl Bash a Success! A few brave Broncos fans joined an overwhelming sea of blue and green jersey-clad fans at On the Rocks in Kailua-Kona for the season-ending championship game Sunday. General Manager Greg Peterson emceed the event with games and prize giveaways throughout Super Bowl 48. The halftime raffle prize was a $200 gift certificate to our sister restaurant Lava Lava Beach Club in the Waikoloa Beach Resort, while the Grand Prize was a half day sport fishing charter. Our ace culinary team turned at award-winning grindz for the crowd. We caught some of the action in these pictures. Enjoy!